Please note that all information appearing on TLS Stats are submitted by users and have not been verified by TLS. Emac 167 3.1 3.3 Political Science Female No MD 2010 Accepted $12K/year. Not sure that I want to live in Philly. robertjordan1940 165 3.5 Political Science/Philosophy Male No NJ 2011 Accepted 22k scholarship. As an out-of-stater, that barely puts a dent in a 78k JD tuition. ibe84 164 3.6 3.6 Political Science Male No PA 2010 Accepted Withdrew. $5,000 a year/$15,000 total. Fee waiver for the app. Notified via email February 24.
riburn3 161 3.5 3.5 Nursing Male No TX 2009 Applied Fee Waiver. Toast93 161 3.3 3.3 Economics Male Accepted Faculty Scholarship - 11, 250 over three years (3,750 per year). BTWalk 161 3.4 Political Science, Philosophy Male No PA 2012 Accepted 3,750/yr. HauntedStarling 160 3.6 3.6 English Female No PA 2007 Accepted Rejected their offer. genius5432 160 3.4 3.4 Political Science Male No PA 2012 Accepted $7,500/year with top half stip. jlamb 160 2.7 2.7 Computer Engineering Male Yes PA 2010 Accepted w/ full tuition scholarship. Registered! amg414 157 3.3 Sociology Male No NJ 2011 Accepted Declined, no scholarship, out-of-state tuition. sfwillia 157 2.8 2.8 Women's and Gender Studies, Film Studies Female 2015 Applied Applied 2/29. 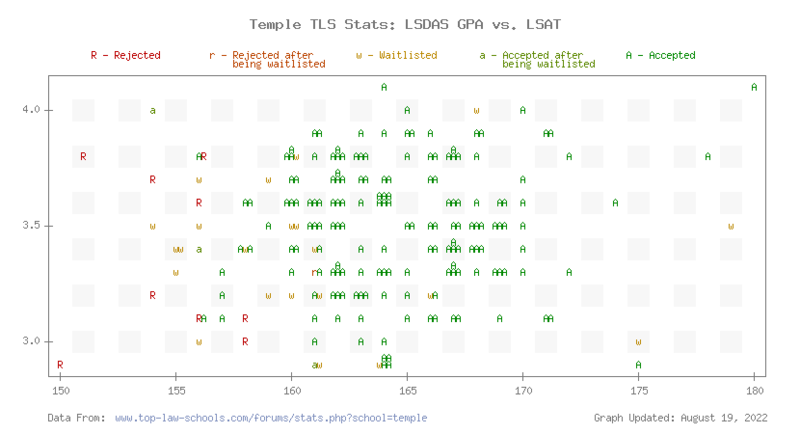 Be sure to check out the TLS Profile on Temple Law.